Our ‘Tequila Sunrise’ Combination is perfectly named, having all of the colors present in a well-made and colorful cocktail of the same name. Made with Tequila, orange juice and sweet, red, grenadine syrup, the three MiniFamous™ Calibrachoa in this flowering combo are the perfect representation of those three ingredients. 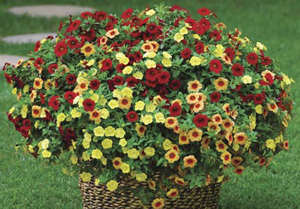 MiniFamous Calibrachoa Apricot Red Eye, Double Lemon and Vampire are as intoxicating as the drink can be! The plants in our 'Tequila Sunrise' plants are grown and shipped in fine quality growing medium and are guaranteed to arrive alive and ready to thrive.